Many would argue it takes a lifetime to become an adult. According to Dustin Garneau, catcher with Triple-A Charlotte, Michael Kopech did it in a day. It was on July 5 at home against Durham, when Kopech exited after walking four and allowing four earned runs in three innings. Kopech’s reaction to the home-plate umpire on that night and the situation overall was not a positive one in Garneau’s mind. “[Kopech] showed a lot of immaturity that game,” said Garneau, who joined the White Sox this weekend from Charlotte with Kevan Smith going on the paternity list. “The ump did squeeze him a lot. That didn’t help. On the one hand, I can’t help but laugh at the idea of someone “learning maturity” after having a single conversation. People are a lot more complicated than that; personalities and instincts run a lot deeper than that. Personal change takes years of hard work, and it tends to come in fits and starts. No one just goes to therapy once. Not anyone who wants to get anything out of it. On the other hand, there’s Michael Kopech. Now, I’m not saying it was all ever about his maturity level. Maybe Kopech just used to run into trouble because he was like any other imperfect pitcher, with imperfect mechanics. But with Kopech in 2018, there really does appear to be a moment where the switch just flipped. Into early July, Kopech was a big-stuff pitcher who couldn’t get out of his own way. Since the middle of that month, he’s dramatically changed his pitching identity. July 5 was the last time Kopech had a bad start. After that game, he had a season strikeout rate of 30%, but he also had a walk rate of 15%, and he’d thrown just 58% of his pitches for strikes. He also wasn’t getting better. Over a seven-start stretch, he had 31 walks and 43 strikeouts, with a strike rate of 54%. Over three innings on July 5, Kopech walked four batters. Kopech next took the mound on July 14. Since then, he’s made a total of nine starts, spanning 52 innings. He’s walked four batters combined. He has 67 strikeouts. Kopech hasn’t looked anything like his old self. 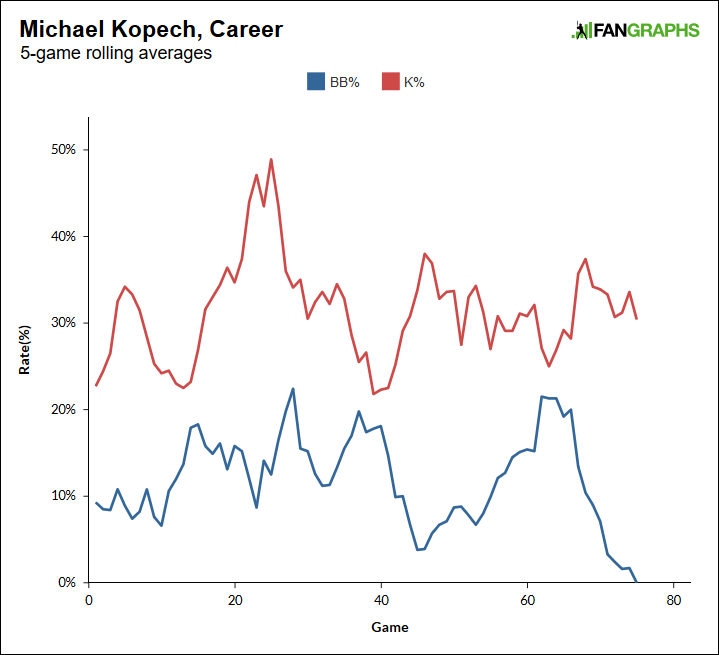 Pitch data exists for 75 of Kopech’s career pitching appearances. Of his 14 highest single-game strike rates, eight have come in his last nine appearances. The one exception was a game where he had a strike rate of 67%. Just based on strike rate alone, Kopech has gotten into the territory of the elite, and he’s still missing bats. He’s probably going to always miss bats. You can see there was a bit of a strike-rate surge before. 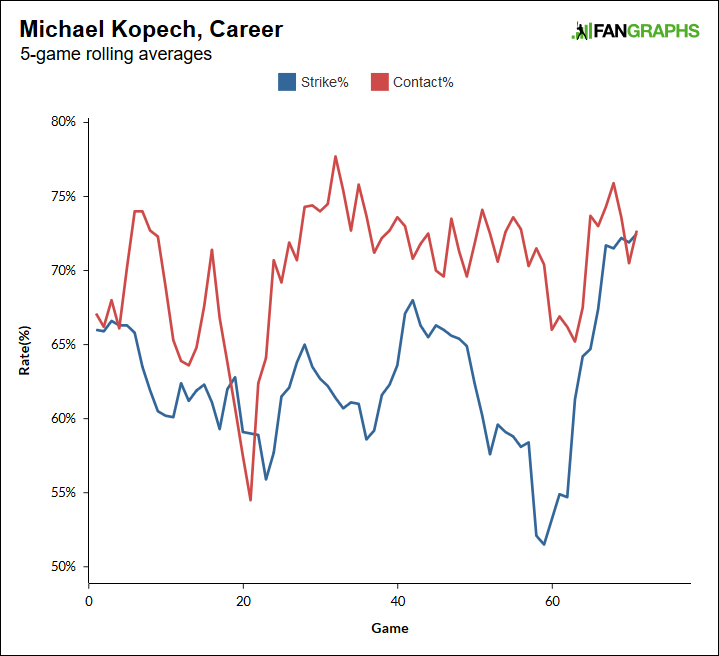 Down the stretch last season, Kopech also looked fairly under control. Still, lately, he’s been blowing those strike rates out of the water, and against more advanced competition. Kopech is in the majors now. Obviously, he’s not a qualified starter. He’s thrown only eight innings, and 138 pitches. But if he were qualified, his strike rate would be the highest in either league. Kopech has generated an extremely high rate of first-pitch strikes. He’s generated an extremely high zone rate with his fastball. It is of course far too early to evaluate Michael Kopech, the major-league starting pitcher, but in the early going he’s carried over what he’d been up to in Triple-A. And in Triple-A, he seems to have figured things out in an instant. There’s nothing mechanical that I could spot. Not easily. One explanation, as offered by Garneau, is that Kopech has quickly matured. Another explanation is that Kopech has learned to back off his best stuff. So the theory goes, Kopech is no longer trying to throw every pitch at 100%. It stands to reason that could help him more frequently repeat his mechanics. I don’t know which it is, or whether it’s a combination. Could be more going on, as well. What’s most important is that, all of a sudden, Triple-A’s wildest pitcher turned into a strike-throwing machine. Practically between starts, Kopech changed from Tyler Chatwood into Jacob deGrom. It’s easy to dismiss one or two good starts, but when they add up like this, it creates a strong impression. The changeup hasn’t yet been frequent or consistent. And it’s actually hard to tell the slider and curveball apart. The curveball, for Kopech, is a newer pitch, and compared to the slider, it has very similar movement. But it is a few ticks slower, and I’ve seen there are different hand signals for them. Kopech seems to like the slower curve to open at-bats, and his slider-curveball relationship kind of reminds me of Patrick Corbin, and how he varies his slider speeds. It’s the same idea, getting two pitches out of one movement profile. The second, third, and fourth pitches should come along for Kopech over time. The fastball is what allows him to stand out. It’s a fastball that can get into the high-90s, and it’s already shown one of the highest spin rates in the majors. Kopech has thrown 60% of his fastballs in the strike zone, which is very high, and he’s also exclusively thrown fastballs so far in any count with more balls than strikes. In part, I think this is the White Sox easing him in, trying to get him comfortable at the highest level. They just want to get him rolling first. But the fastball is also going to be Kopech’s primary weapon, in any situation. Based on speed and movement, the most similar fastballs thrown by right-handed starters belong to Nick Pivetta, Gerrit Cole, and Zack Wheeler. That’s not a bad group of comparables. I don’t think Kopech is going to throw 70% strikes forever. I don’t think Kopech should want to throw 70% strikes forever. He’s going to want to go out of the zone more often, when his other pitches gain a little more consistency. Any fastball becomes a hittable fastball when the hitters know it’s coming. But, for one thing, Kopech’s heater is good enough for him to lean on. And, for another, you have to understand how surprising it is that we can talk about this in the first place. Not even two months ago, Kopech looked miles away from being major-league ready. He couldn’t stay in the zone against Triple-A opponents. Now, if anything, his strike rate is too *high. * For the entire White Sox organization, overall, it was a frustrating first half. The second half has been a hell of a lot more promising. We hoped you liked reading Michael Kopech Can’t Stop Throwing Strikes by Jeff Sullivan! Forgot to mention it, but for whatever it’s worth, the “maturity” explanation is very similar to the one provided for Blake Snell’s 2017 midseason turnaround. Snell certainly hasn’t looked back. On August 16th (Kopech’s last minor league start before being called up), Brian O’Grady of the Louisville Bats laid down a bunt single in the 2nd inning against Kopech. After which, Kopech became anger, wound up, and threw the ball out of the park. Then two innings later, still upset, he drilled O’Grady with a high-octane fastball causing the benches to empty. All this because of a 2nd inning bunt! Really? Seems Kopech needs another talk with Garneau since the effect of the first talk evidently wore off after 6 weeks.